Cooler temperatures last week impacted soil temperature and growth rates which will bounce back quick this week with good weather predicted. 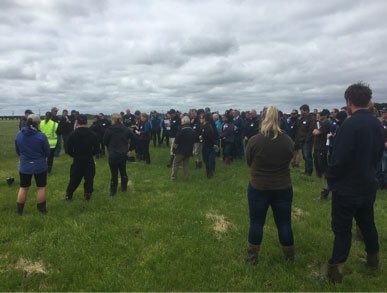 The Hub Field day on the 14th November was a great success with 125 people registered as attending. Updates were given from the AgResearch and DairyNZ research teams on current and planned research for the farm (Handout will be available on the website next week). During the recent wet weather all cows were offered 1.5kg/c/d PKE:Barley mix in the shed which stopped at the start of the week. Cows less than BCS 4 are offered the 1.5kg/c/d. Topping behind cows continues. The remaining 12ha of fodder beet planted on the 14th November. Kale ground ready to sow possibly this week. On average 30 cows per day are required to achieve target submission rate. The calving spread of 17 weeks (spring 2017) means a focus on bringing our later calving cows forward over time. R2 heifers are now all on the young stock block after spending some time on the platform over AB for ease of access to the yards. R1 heifers are being weaned as they hit 85kgLW and will start being transferred over the river next week. Later born heifers are being fed a mixture of milk from the ‘withheld’ herd and powder to finish them off, along with meal. The past fortnight has been busy, including arrivals and departures. Georgia Phillips, our casual research technician, left on the 31st of October to head home for her lacrosse season. The technician team have missed her presence. Nicole Hammond, who is a part time research technician and graduate developer within DairyNZ, returned on Monday the 13th of November from her holiday. Over the past two weeks we have completed our fortnightly herd test and body condition scoring, along with weekly pasture measurements and snip cuts of our forage value index paddocks. The snips of the forage value index are collected at 1 pm every Monday, Wednesday, and Friday as the FVI paddocks come up for grazing. Samples are sorted for botanical composition before being oven dried. A sample is also collected for quality determination by NIRS (Near InfraRed Spectrometry) and dried before being sent away for analysis.